Manchester, England (AP) — Moeen Ali finished South Africa off — with bat and with the ball — as Joe Root led England to a long-awaited home series win over the Proteas in his first assignment as captain. Offspinner Ali took 5-69 to settle the fourth and final test on Monday, giving England a 177-run victory at Old Trafford, a 3-1 series win, and ending a 19-year drought at home against South Africa. It was England’s second successive series win over South Africa after winning in South Africa 18 months ago, but South Africa had been defiant in England since 1998 and had ended the reign of three previous England skippers. Root began his reign by conquering South Africa. Ali played two pivotal parts in the series-clinching victory, first hitting a flamboyant 75 not out in England’s second innings to ensure the lead was out of South Africa’s reach. He then broke a 123-run stand between Hashim Amla (83) and Faf du Plessis (61), seeing off South Africa’s last bit of fight with the first of his five quick wickets on Day 4. Having made the breakthrough, Ali sent England surging to victory with plenty of time to spare as the last seven South Africa wickets fell for 39 runs in just over 12 overs. England set South Africa 380 to win, and bowled the tourists out for 202 in their second innings soon after tea. 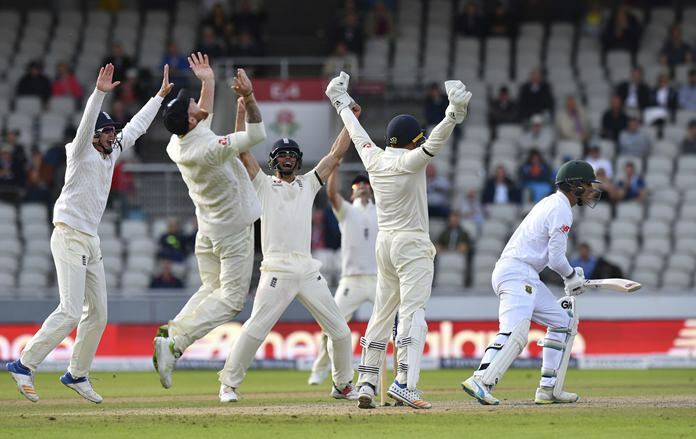 In their first series under Root, England were ultimately convincing in three of the four tests, with their only wobble coming in a heavy defeat in the second match at Trent Bridge. Having won by 211 runs in the opener at Lord’s, England responded to the defeat in Nottingham — and questions over Root’s young leadership — with dominant victories at The Oval and Old Trafford. The end, and Ali’s five-for, came quickly as South Africa’s last hopes went when the stand was broken with the departure of Amla, lbw on review to England’s offspinning allrounder. Ali removed Quinton de Kock and Theunis de Bruyn in the space of three balls in his next over, and sealed victory by claiming the final two wickets of the test in successive balls. Twice Ali changed the momentum of the game, breaking the Amla-Du Plessis resistance and, a day earlier, responding to England’s second-innings struggles with his boundary-filled 75 off just 66 balls. Before Ali’s entrance, England were in some trouble at 129-5 and then 153-7. Ali was part of partnerships that added 109 runs to England’s lead in that second innings, and then changed the course of the last day as South Africa went from 163-3 to 173-6 in the space of 17 balls. With that, the Proteas were all but done. England weren’t perfect in their first four tests under Root. Root and former captain Alastair Cook aside, the top order consistently misfired. But from No. 5 down, England have a steady stream of match-winning allrounders. Ali, Ben Stokes and wicketkeeper-batsman Jonny Bairstow all made match-changing contributions during the series. “It’s a real luxury to have,” Root said.